We recently went to Izmir and it was one of the best trips ever but I could not for the life of me capture it in an entry. Instead I just made an album with really long captions. Enjoy! Also, Fahad is here! Yippie!! Ooh, ooh that smell…Can’t you smell that smell? Have you ever walked into a bathroom at work and it has absolutely reeked like someone has explosive diarrhea? And you go in and take the quickest wee ever to escape only to see that another colleague is waiting to use that stall. And you can tell that they think it was you. It’s the worst. This past weekend our dinner guests came with a very large bag. When R put the bag in the fridge my heart did a little jump. It haddd to be dessert. A BIG dessert. I rushed through dinner excited by what might be waiting in my fridge. When the moment finally came, I went to take out the box. It was so heavy! I was afraid that I would drop it for a minute. I opened the top as slowly as I could manage, trying to maintain some air of dignity. But then I saw the cake. What an amazing, beautiful cake it was! Feraz quickly commented that R knew the way to my heart. Indeed. The cake did not disappoint. It was filled with nuts and berries. There was a beautiful layer of mousse in the middle. Every piece, every bite was amazing. Needless to say I have been having it for every meal since then. I am especially worried that it is going to go stale, so I am eating it as fast as I can. Anyone who knows me at all knows that I have an intensely dangerous sweet tooth. Istanbul makes it so much harder because everything is so new. In the U.S. there may be a hundred cookie options at the grocery store but at least the years there have taught me what I like and what I don’t like. In the grocery stores here I spend hours walking up and down the aisles, putting in packet after packet of cookies and sweets. One week I pick up the Magnum Minis, another there is the Vienetta ice cream. My favorite cookies so far have been Tuktus. They don’t look impressive at all. They actually kind of look like something that has been sitting in your senile grandma’s cupboard for months. And at the low price of .80 lira, they don’t seem too promising. But once you have one, you are hooked! There is a nice crispy exterior, followed by a surprising, but welcome nutella center. Dipped in a Nescafe 3in1, they are pure magic. Another grocery store wonder are mini brownies. Feraz and I found them on our very first trip to the grocery store. The shop was literally a hole in a corner and I wasn’t expecting much, even though they were in a lovely red package. But my God, I have no idea how SO MUCH moisture can be packed in such a little brownie! I know that brownies are one of those things that you feel are always best freshly baked, preferably by a kind friend or mom, but for those lonely fat souls out there, these are perfect! Dare I say, even better than home baked?? I have already gone way too far into this entry without talking about the mother of all desserts in Turkey. Some might say it is the bakhlava. 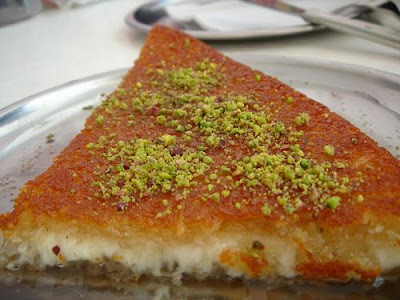 Others might profess it is the profiteroles but my heart belongs to kunefe. It is a beautiful pastry filled with cheese, dripping with syrup, topped with pistachios. It is usually served warm with a dollop of cream on top. To have a full experience, I take it with a scoop of cold ice cream. Sweet, sweet heaven. Already, I am becoming increasingly concerned about what I will do without all these sweets when I go back to the U.S. Obviously, there is only one solution. Never leave Turkey. When I was younger, so much younger than today I read a book called the Celestine Prophecy. In it the author discussed the various energies of the world and the importance of being in tune with these energies. By being conscience of the signals the universe is giving around us, it is possible to live the best possible life. In a very simplified version, the idea is to go with the flow. In the Alchemist, the author promotes the concept that if you really want something, then the whole universe will conspire to help you attain it. As human beings, I think we all have a simple base desire to be happy. We strive to reach happiness in love, in our friendships, in our accomplishments, and in our families. But we do not honor love, we do not surround ourselves with the people that make us better, we do not strive for accomplishments that fulfill us and we cut ties and create distance with our families. Although we know what we want, and the universe is easily capable of giving it to us, we take the paths that lead to stress and unhappiness. We complain about friends that don’t give us the time and attention we need. We go to jobs that aren’t fulfilling, or go to school for programs that we aren’t interested in. We create castles built on unhappy foundations and then we feel trapped within those walls. Of course all of us don’t do all of these things but most of us do some of these things and then we plead helplessness when confronted with the consequences of our choices. My coming to Istanbul coincided with losing my best friend and I can easily say it was one of the hardest things I have gone through in my life. I was so angry and hurt. I felt I would never get past the bad feelings and pain. I literally thought I would never stop crying. When we are going through something extremely painful it can be hard to believe that the universe is conspiring to help us. It can be hard to be in tune with the energies of the world because every part of our being is trying to go against them. And it can especially be hard to patiently preserve when we do not understand the nature and virtue of the test. It is at this time more than ever that we need to do those things though. At the beginning I fought the urge to feel better. I wanted to feel sad and I would lay in bed refusing to do anything other than mope. But somewhere along the way something in me said, enough is enough and I began to re-emerge. Since then I have become a bit of a yes-woman. If anyone asks me to go out or to do something, I say yes. If there is an opportunity to apply for something, I fill out the form. If there are new people around, I talk to them and I try to give myself as openly as I can. I feel I have not been this open to life since I was very, very young and the rewards for this rediscovered perspective have been ten-fold. In these last two months I have met some of the most amazing people. We have made friends from Denmark, Palestine, Dubai, Canada, Slovakia, Romania and so many other places. We opened ourselves to Turkey and in return she has showered us with so many amazing experiences and has filled our lives with Turkish people who truly live up to the great reputation that precedes them. And when I go to bed at night, it is with a body tired from adventures and a mind already excited for the prospects of the next day. I understand that life will not always stay this wonderful and feel so good but I am also convinced that God did not put us on Earth to be miserable and that the universe is not out to get us. Happiness is in our reach but to grab onto it, we must first have the courage to let go of the negative things that we have been holding on to. How you gonna upgrade me? What’s higher than number one? Today I was walking behind a guy and for the life of me I could not tell if he had just washed his hair or if he had not washed his hair in a really long time.